How Many Protein Shakes Should You Take A Day? Take as many as you need with enough protein in them to hit your daily target of grams of protein. For the majority of people this is going to be somewhere between 0 and 3 protein shakes a day, with between 20g and 40g of protein in each. Your daily intake target for protein (if you're looking to build muscle) should be 1g for every 1lb of bodyweight. So if you're 11st you want to aim for at least 154g protein/day. Get your whole food meals sorted first. Before you can work out how many protein shakes you should be taking a day, you want to work out an awesome set of whole food meals first. Your actual meals are the most important part of your diet – the protein shakes are just their to supplement it and get that protein/day number up. Figure out what meat and whole foods meals you are going to be eating (build it around meat and vegetables). Work out how many grams of protein there are in each meal. Find the total number of grams of protein you're getting from your whole food meals. 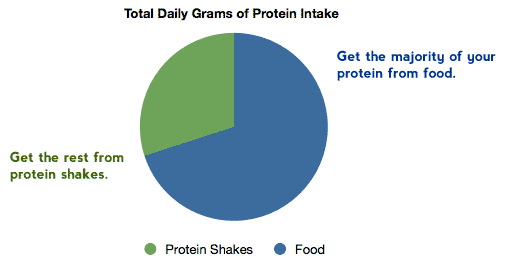 From there you simply add in the protein shakes to hit that total protein/day target. As a starting point, aim to eat at least 3 whole food meals with each containing around 35g to 40g of protein per day. That will give you a strong ~120g protein/day to start with. So, how many a day? Pretty straightforward. Just hit your target with the help of protein supplements. Take as many as you need, but the more protein you can get from whole foods the better. The entire pie chart resembles your daily protein intake goal. The bigger you can make the blue section the better. Here are a few Internet polls I found asking forum members of bodybuilding sites how many protein shakes they take a day. The vast majority have less than 4, with 2-3/day being the most popular amount. This just goes to show that there's no magic number. It all depends on your own needs, diet and schedule. Protein shakes aren't bad for you. It's just protein. Take as many as you need and don't worry about it. 18st and taking 4 big protein shakes a day along with 3 or 4 superb whole food meals, that's fair enough. 10st and taking 4 big protein shakes along with just 1 meal of beans on toast, I'd be concerned. Aim to get the majority of your protein intake from meat and whole foods. They're full of the nutrients that your body absolutely loves and needs to create the perfect environment for building muscle. As long as you're getting a minimum of 50%+ of your daily total grams of protein from food like; chicken, steak, fish, and eggs, I wouldn't worry about the number of shakes you're taking. It's not like you're chugging Paracetemol or downing Ibuprofen – it's just harmless protein. When are the best times to take protein shakes? To be honest, aside from having a shake after a workout there aren't optimum times to take your protein shakes. And if there are optimum times, they're micro-adjustments that will have a minimal effect on your progress. You're far better off worrying about your daily protein intake than the actual times at which you have your protein shakes. Just fit them in around your daily schedule and do what works best for you. Personally I'd make sure that you get your post-workout shake, and after that as long as your protein intake at the end of the day is good the specific times you have those shakes is not going to make a difference. If I'm not going to the gym on that day I'll just have that post-workout shake in between a meal. Can you have 2 protein shakes in a row? I order my protein shakes and meals a little something like this. I usually have more than just meat and eggs for my food, but that's an awesome place to start. I prefer to not have 2 protein shakes in a row if I can help it. Protein shakes don't deliver a tasty balance of good fats and carbs along with all that protein, so I don't like to go too long without those. The more proper food the better. Protein 101 – StrongLifts.com – Why you need protein, how much you need, a few myths. Great video dispelling myths about protein and highlighting the main benefits. The bit about daily protein consumption starts at 3:03.